Turkish cuisine which has inherited the Ottoman heritage could be described as a fusion and refinement of Turkic, Arabic, Greek, Armenian and Persian cuisines. Ottomans fused various culinary traditions of their realm with influences from Middle Eastern cuisines, along with traditional Turkic elements from Central Asia such as yogurt. The Ottoman Empire indeed created a vast array of technical specialities. It can be observed that various regions of the Ottoman Empire contain bits and pieces of the vast Ottoman dishes. Taken as a whole, Turkish cuisine is not homogenous. Aside from common Turkish specialities which can be found throughout the country, there are also region-specific specialities. The Black Sea region's cuisine (northern Turkey) is based on corn and anchovies. The southeast—Urfa, Gaziantep and Adana—is famous for its kebabs, mezes and dough-based desserts such as baklava, kadayıf and künefe. Especially in the western parts of Turkey, where olive trees are grown abundantly, olive oil is the major type of oil used for cooking. The cuisines of the Aegean, Marmara and Mediterranean regions display basic characteristics of Mediterranean cuisine as they are rich in vegetables, herbs and fish. Central Anatolia is famous for its pastry specialities such as keşkek (kashkak), mantı (especially of Kayseri) and gözleme. 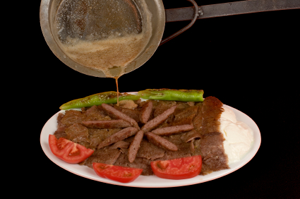 Kebabıstan has served to the citizens of Ankara for more than 50 years, with its delicious kebabs. A place where you can get rid of the mass in the city. Chill in the nature and have the tasty food at this meat restaurant. Where you can find various types of World tastes and enjoy your time at the same time. Serves Italian and American food. Live music in the garden. Tables on the roof and by the fire place can be reserved. Great place and delicious food. Located in downtown, however it has an amazing country side setup with various delicious food. Serves the best pasta in town. If you think you had pasta before, try this place, we bet you are going to like it. Enjoy your meal! Since 1972 located in one of the most interesting parts of the city. After the restoration of the Mahmud Nedim Zabri Villa, the restaurant gained its characteristic final appearance, where you can relax and enjoy your time. With its ancient style, Agora restaurant is one of the most popular restaurants in town. Side dishes and appetizers which are prepared by Cretan cooks are the special dishes of the restaurant. Various types of sea food is served with special cigars in A La Carte style. Located in downtown. A nice setup which takes you away from the stressful city streets. Most famous restaurant in town. Serves traditional Turkish food, grilled meat and sea food. Traditional Turkish food and additionally various types of dishes from all around the World are served at the restaurant Gumus Kasik (Silver Spoon). A special restaurant where you can have your meal during the live piano performance by the famous players who are currently visiting the city.